Dolly Hughes is thrilled when she is able to get all 10 shots on the paper plate targets at A Girl & A Gun's Friday Night Girls Night Out session. 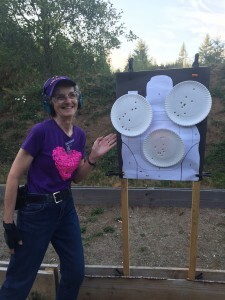 Dolly Hughes is thrilled when she is able to get all 10 shots on the paper plate targets at A Girl & A Gun’s Friday Night Girls Night Out session. 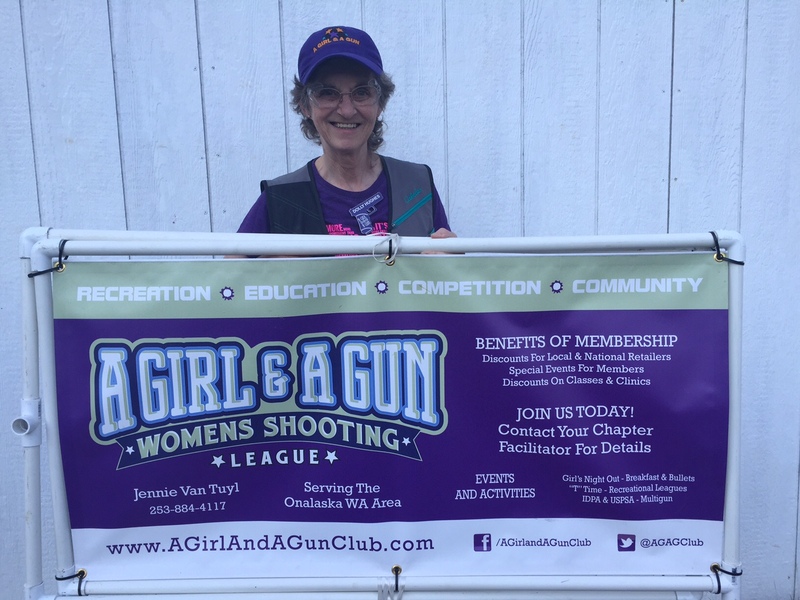 At 67-years-old, Dolly Hughes is facing her fear of guns with the help of A Girl & A Gun Women’s Shooting League (AG&AG). When you are afraid of something, you have two choices – avoid it or face it head on. 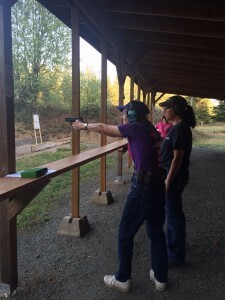 At age 65, Hughes decided to face her fear of guns. Hughes has some history with violence committed with guns in her family. Her exposure when she was younger was when her dad would place a pistol in her hand and tell her to shoot. He skipped teaching about how to stand or how to lean forward for balance. By any standards, she has every reason to be fearful of guns. But one day she decided she wanted to find out more about them in order to ease her fears. Fortunately for Hughes she lives in Onalaska, near one of the state’s premier gun ranges, Firearms Academy of Seattle (FAS). She took the first step by taking the firearms safety class, where she says she learned that, “Guns are inanimate objects that don’t do anything until I pull the trigger.” Excited with her newfound knowledge of how guns work, and her ability to overcome her fears, she continued to take more classes. In her classes, the instructors mentioned A Girl and A Gun Women’s Shooting League (AG&AG), which has a chapter based at FAS. She kept the idea in the back of her mind, and joined a few months later. AG&AG features a monthly Friday night Girls Night Out, where members gather to practice their shooting skills, then share dinner together. One Sunday afternoon a month, the group has Trigger Time (T-Time) where the women learn a variety of skills as well as other topics such as holster selection, purse carry, and other self-defense techniques. A Girl & A Gun Women’s Shooting League is open to all women. Hughes’ first experience with AG&AG was almost more than she was ready for. They were practicing moving for a type of shooting competition hosted by International Defensive Pistol Association (IDPA). Hughes had to draw a gun from a holster and shoot while moving. She did it but was so scared she almost didn’t go back. At that event, Hughes’ picture was taken for a Women & Guns magazine article and ended up as the cover photo. “It was a good thing it was a picture of my back, because if it had been of my face, everyone would have seen how terrified I was,” Hughes laughed. When asked what has surprised her the most about her newfound knowledge of guns, Hughes pauses thoughtfully, then responds, “That I was able to do it, that I’m able to actually shoot a gun, and that I hit the target,” she laughs. She highly recommends AG&AG. “You’re exposed to things that you probably don’t think about when you take a safety class.” Hughes believes the group has exposed her to things that she doesn’t learn in classes, but also helps her practice skills she learns in the classes. For instance, she took the Fundamentals of Home Defense class where she learned to shoot while holding a flashlight, then was able to practice that skill more in AG&AG T-Time. The classes and the league feed off of each other to help increase and improve skills. Hughes keeps practicing her shooting skills. Co-facilitator, Melissa DeYoung, stands close by in case Hughes needs instruction. At a recent T-Time event learning about shotguns, Hughes was unusually quiet. She had never shot a shotgun and didn’t think she could do it, or that she could do it without pain. The group learned about types of shotguns, how they should fit properly and how to hold it so that it didn’t create pain or bruising as is often seen. When it was Hughes’ turn to step up and shoot for the first time, she didn’t hesitate, although her apprehension was apparent. After a couple of shots though, the typically chatty Hughes was back. She did it and she didn’t hurt. As often happens with women when they try shooting and enjoy it, their next step is purchasing a gun. Hughes is now looking for her new perfect shotgun. Onalaska Chapter Facilitator Jennie Van Tuyl may be reached at 253-884-4117.